We carry the top brands of skincare product soap dispensers including Dial, Purell, kimcare, impact and Gojo. Our restaurant supply soap dispensers are great for the kitchen sinks as well as the restrooms in your restaurant. 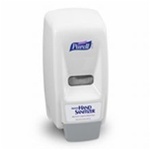 If you want to try and curb the spread of germs even more, buy our touchless soap dispensers. Gojo Soap For Wall Mount Dispenser Bag In Box - 1000 Ml. Tolco Plastic Clear Choice Soap Dispenser White - 50 Oz. Soap Dispenser Black - 800 Ml. Soap Dispenser White - 800 Ml. Black Bulk Soap Dispenser - 30 oz. Soap Dispensers at wholesale prices for your everyday restaurant supply needs mount on your walls near sink areas for easy access. Restaurants must maintain a clean, germ free atmosphere for their guests and cleaning your hands are an important part of that. Commercial soap dispensers come in different sizes depending on your needs. 500 ml, 800 ml, 2000 ml, and 1000 ml refills. Wholesale soap dispensers are easily mounted so they don't take up room on the countertop.